If you have a late flight or a late meeting, or maybe just feeling lazy (you’re on vacation so you deserve to be! 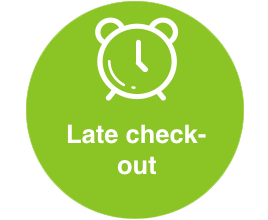 ), you can book your apartment and add your departure time information in your reservation. We’ll do our best to accommodate your needs. This offer only applies to reservations of 7 nights or over.